I knew I wanted to study some form engineering since my favourite subjects at school and college were physics and maths. After visiting the Eastbourne Air Show and seeing some of the aircraft, including the Euro Fighter Typhoon, I decided that I’d love to study aeronautical engineering. I visited some universities that offered aeronautical engineering but found that most of their courses were very theoretical based. However, I found that Brighton’s engineering department had a good balance of theory and practical work! The projects such as building robots interested me and after seeing the workshops we had access to in order to build them, I decided to choose Brighton. Four inspirational speakers have been in to talk to our engineering students recently. 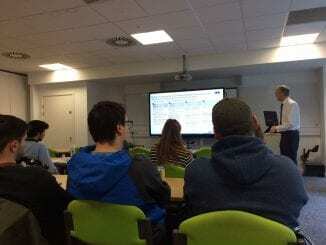 Speakers from the global companies, Ricardo and Thales UK plus entrepreneurs Mike Jay (Myklops) and Steve Ransom (Brighter Bikes) provided inspiration for future careers and workplace journeys came to talk to final year and postgraduate engineering students. The visitors, all local to the Sussex area, were invited by the engineering department’s Principal Lecturer Richard Morris. I chose to study Aeronautical Engineering at University of Brighton because the course offered an engaging hands-on approach. I chose to specialise in aeronautical engineering as I was always fascinated by the dynamics of flight. 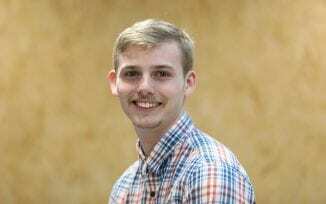 When I was accepted, I was excited by the prospect of specialising my studies. A year in industry gave me the opportunity to explore my professional interests before finishing my course, adding to the appeal and it highlighted the areas of engineering that interest me most, changing my ultimate career goals and re-energising me for the final years of my course. The demand for engineers is greater than ever and it’s a fascinating field to get into. 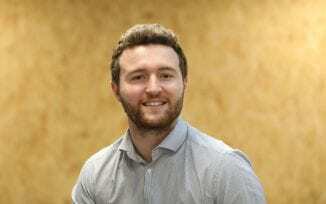 I chose Mechanical Engineering as it’s the most diverse course you can do and from that you can go into any aspect of engineering, and practically any technical job. The most interesting aspects of the Mechanical Engineering MEng course are the different rage of modules we study. From Advanced Computation Fluid Dynamics to Engineering Business Management, the range of skills we are taught are very exciting and contribute to an extensive skillset to take into the working world. 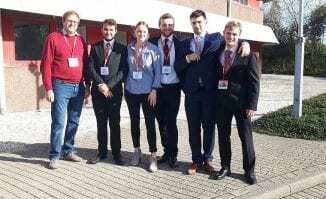 Five Engineering students from the University of Brighton have been selected as one of just two teams across Europe to take their ground-breaking project into zero gravity. The members of the team, PHP Cubed, are all undertaking masters degrees in either Aeronautical or Mechanical Engineering. Georgie Crewdson, Tom Critchley, Matteo Pontecorvo, Liam Ardagh and Alex Evans will participate in the flight programme Fly Your Thesis! in Autumn 2019. 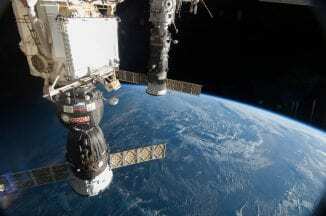 The students will be given the opportunity to test their project in a zero-gravity environment aboard an aircraft in Bordeaux, France, that simulates the weightlessness of outer space. Fly Your Thesis – presentation day! 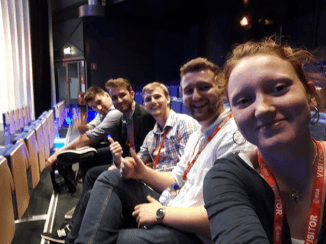 Friday 12 October – presentation day! We were all so excited for today! Everyone is dressed up and very nervous. 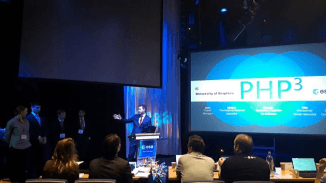 Six presentations were given during the day from Polish, German and Italian teams with subjects ranging from 3D printing to Cancer research. It was such an amazing and inspiring experience and we meet some very talented people. Our team performed well and we enjoyed a good interactive Q&A from the panel following the presentation. It was a beautiful day in Amsterdam so we took the opportunity to explore before we left later that day. Comment	Fly Your Thesis – presentation day! We were on the train to Gatwick at 10.30, leaving sunny Brighton fully prepared for an exciting few days and arrived in an even sunnier Amsterdam later that day! We stayed in Noordwick tonight to do some serious preparing before we meet all the other teams tomorrow. After lunch we were welcomed by the European Space Agency (ESA) Education Office and introduced to Novespace, ELGRA (European Low Gravity Research Association) and shown around ESA’s super confidential space testing facilities. No photos for this, sorry! We are delighted to have Mark Gallagher as a guest lecturer here on 1st November. Mark is a well-respected public speaker who provides keynote speeches and presentations on a range of business topics relating to his experiences gained whilst working in senior management roles within Formula One auto racing over the last 30 years. Today he is co-commentator and Formula One analyst for the BBC in the UK as well as founder and CEO of Performance Insights. Mark is renowned as an insightful, informative and highly entertaining speaker, and will be staying after his lecture to chat to guests. Everyone is welcome, the venue is Huxley 300, 7pm. 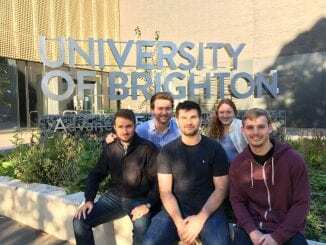 Five University of Brighton Engineering students are bidding to take their ground breaking space research project into zero-gravity next year. 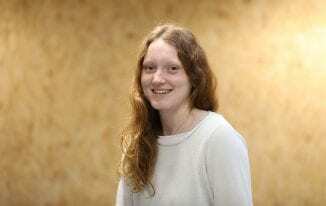 A University of Brighton graduate has been selected as an astronaut for scientific missions in space. Sultan Saif Muftah Hamad Al Niyadi, who graduated in electronics and communication, is one of the first two astronauts chosen by the United Arab Emirates in co-operation with the Russian space agency.